In this Photoshop Effects tutorial, we're going to learn how to quickly and easily create a pop art effect using the Lab color mode. The entire effect takes only a few steps and a couple of minutes from start to finish. Choose Image > Mode > Lab Color to convert the image to the Lab color mode. The "a" channel represents all the colors in the image from green to magenta, and the "b" channel represents all the colors from blue to yellow. We're going to use these two color channels to quickly create the colors for our pop art-style effect. And in case you're wondering, the "Lab" channel at the top isn't really a channel at all. It's just the composite of the three other channels. Go to Image > Adjustments > Posterize to bring up the Posterize dialog box. Click on the "Lab channel" in the Channels palette to see what your image looks like after applying the Posterize adjustment to the "a" channel. The image after smoothing out the color in the "a" channel with the Gaussian Blur filter. Apply the Posterize adjustment to the "b" channel. The image after applying the Posterize adjustment to the "b" channel. 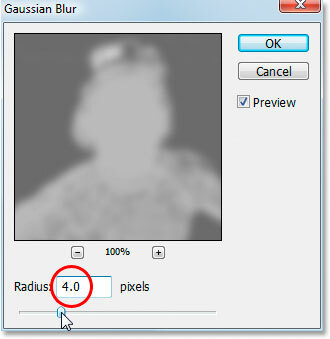 Apply the Gaussian Blur filter to the "b" channel to smooth out the colors. 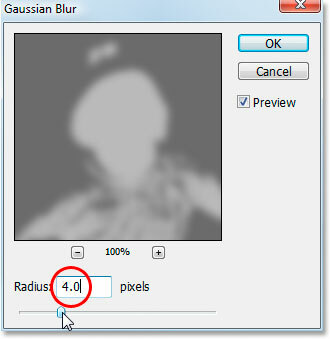 The image after applying the Gaussian Blur filter to smooth out the colors in the "b" channel. We now have the colors for our effect. We're going to adjust the lightness values next. 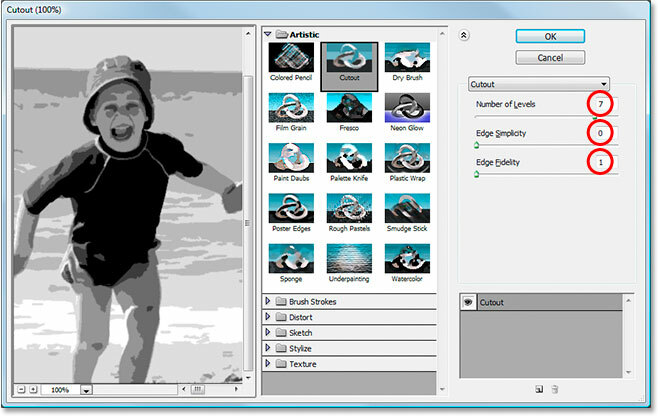 Go to Filter > Artistic > Cutout to bring up the Filter Gallery set to the Cutout filter options. The Filter Gallery may be huge, but the preview area takes up a third of it on the left, and the actual options for the Cutout filter are on the right, and there's only three of them, as circled in red above. Set the Edge Simplicity option to 0 and the Edge Fidelity option to 1. The Number of Levels option at the top determines how many tonal levels you'll have in your image. The lowest value you can enter is 2, and that will make everything in your image either black or white, with no shades of gray in between. The highest value you can enter is 8, which will give you black, white, and 6 shades of gray in between. Each additional shade of gray gives you a bit more detail in the image. The value you enter for "Number of Levels" will depend entirely on your image and on what you feel is the right amount of detail for the effect. The easiest way to determine that is to click your mouse inside the "Number of Levels" value box and then use the up and down arrow keys on your keyboard to raise and lower the value, keeping an eye on the preview area on the left as you do so. You can scroll around inside the preview area as needed by simply clicking and dragging your mouse inside of it. Raise and lower the value between 2 and 8 while watching the preview area until you've found the value that works best. I've settled on a value of 7 for my image. Once you've found the value that works best, click OK to exit out of the Filter Gallery. 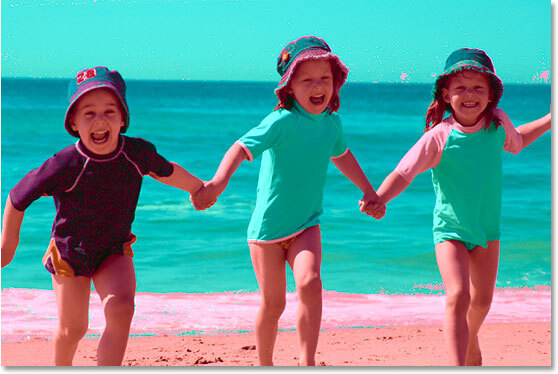 The image after applying the Cutout filter to the "Lightness" channel. Click back on the "Lightness" channel to select it, then go to Filter > Sharpen > Smart Sharpen. Enter an Amount value of 75% and a Radius value of 1 pixel. 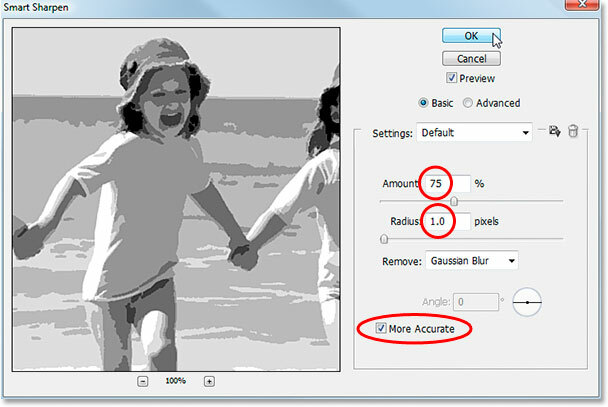 Leave Remove set to Gaussian Blur and check the More Accurate option at the bottom to select it. Click OK to exit out of the Smart Sharpen dialog box, then click on the "Lab" channel in the Channels palette to bring back your full color image. Go to Image > Mode > RGB Color to convert the image back to the RGB color mode. And there we have it! That's how to create a quick and easy pop art effect with Lab color in Photoshop! Check out our Photo Effects section for more Photoshop effects tutorials!